Happy Happy Tuesday!! Who's ready for a new challenge?? You're in luck, the SHOPPING OUR STASH crew are here with Not Your Normal Paper. This week we want to to use a specialty paper you had to have...glitter paper, foil paper, honeycomb paper, corrugated paper, canvas, cork, etc. 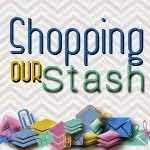 Visit the SHOPPING OUR STASH BLOG for all the details on the challenge and to show my teammates some crafty lovin'. I know I have LOADS of "had to have it" paper in my stash that I have never used...like this red metallic paper..."ohhhhhhhh that'll be great for Valentine's cards" I thought to myself...ya, it probably would be if it wasn't cardboard on the back and almost NO adhesive sticks to it LOL...don't worry I used three different adhesives on my card, there's no way that stuff is movin'!! So here's what I made for the challenge with my "had to have it" red metallic cardboard backed paper (that's what I get for buying paper at the dollar store right???). 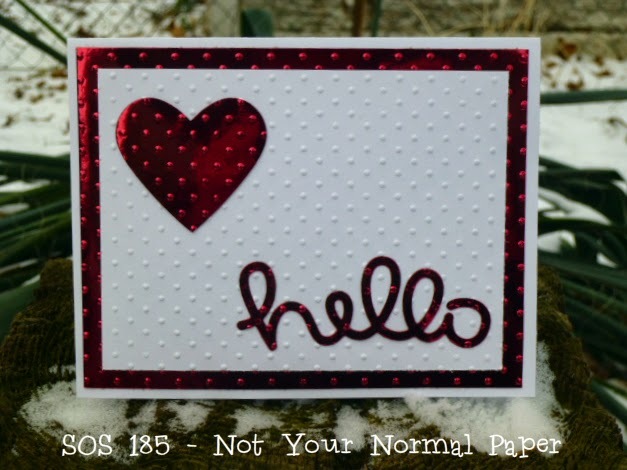 And hated it....so I made the Hello card above. I figure if the DH says..."hmmmmm ya, that's OK" as opposed to his usual "wow...that's awesome" the card is not very good. But for the sake of honest crafting (LOL) I thought I would share it anyway. I am not totally hating it anymore...but I still like the other one better. Lastly, here's a quick peek at my ever present picture taking companion, Gordon. This fella LOVES winter...seriously, if I wasn't afraid his belly would freeze to the patio he'd love to lay out there ALL day long!! And Gordon is too cute. I used to have 2 Lhasa Apsos that begged to be let out into the blizzard to lay down with their noses into the wind. Now that you've used it, I'm thinking I also have some cardboard backed foil paper.....somewhere.....buried.....crap, I REALLY need to organize my sh*t! But I digress. Your cards are both awesome! I do agree, I like the re-do better than the first, but both are fabulous! Best picture? Of course it's Gordon laying in the snow! Yellow dogs - they lurves the snow! Your card is fantastic with all of that textured goodness. I had to laugh because I feel your pain about your hubby's comment. When I got my first guest design spot I made 3 cards. My boyfriend looked at all of them and said, "Hmmm I don't know if the second one is your best work." Needless to say, I didn't use that one! Love it! Not a fan of foil paper and never "had to have it," but I like your use. Nicely done! 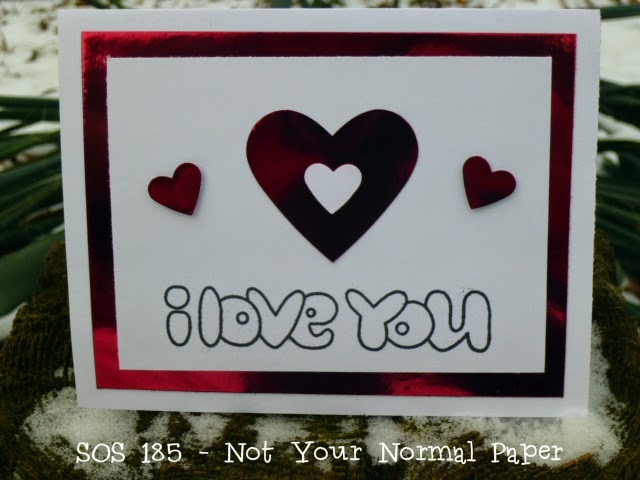 I happen to like both of these (and I should pull out that Paper Smooches sentiment!) but yes, I hear you on the Kevinator. Sometimes you can just read them. Also, Dollarama paper, damn you, seducing us with your shiny & glittery & absolute resistance to all adhesives. Grrr. 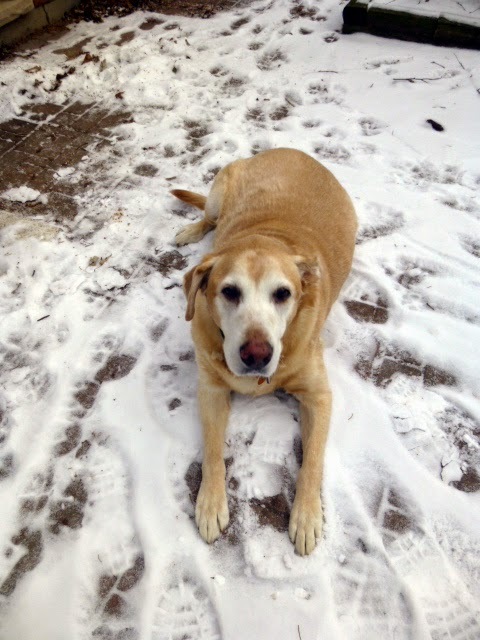 Gordon & Abby both love the snow - she's got a naked belly and still loves it. Weirdos! That paper is beautiful--worth all the adhesive required! I like your second card the best, too, but both of them will make happy mail! Gordon steals the show with this post, though--what a sweetheart--love that face!